My legs shook, my heart raced, and I broke into a sweat despite the cold wind. I had just seen a ghost, a pure white ghost with piercing golden eyes and a five-foot wing span. He was hanging out south of Traverse City, on the side of Division Street. He dove off the utility pole where I had spotted him and grabbed a vole from beneath the snow. Turning to face me, he swallowed the rodent whole in a matter of seconds. Lifting his wings high, he took off in silent flight, leaving behind a small spot of blood in the snow and a speechless, trembling photographer. This was the first of many snowy owls I saw last winter, and I was ecstatic to capture a photographic sequence of his hunt. 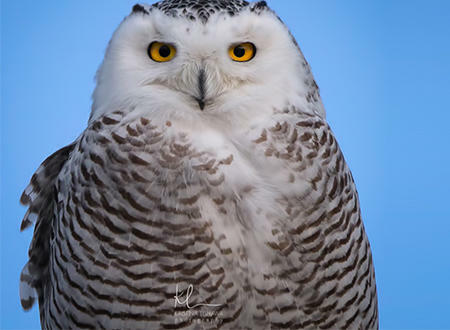 Snowy owls have been appearing regularly over the past several years in Traverse City and the surrounding area. While it was once thought that they left their home far north of the Arctic Circle due to starvation, current research suggests the opposite. A booming population of lemmings in the Arctic summer creates an abundance of food for the snowy owls, leading to a successful nesting season and many baby owls. These young owls are healthy but inexperienced hunters, and seem to know they can’t compete with the older owls for food during the perpetually dark Arctic winter. Their best chances for survival are to fly south, wintering in milder climates where food is plentiful. Their journeys are long and dangerous, but the owls that survive the migration have generally been able to thrive in northern Michigan where rodents and waterfowl provide a steady source of food. 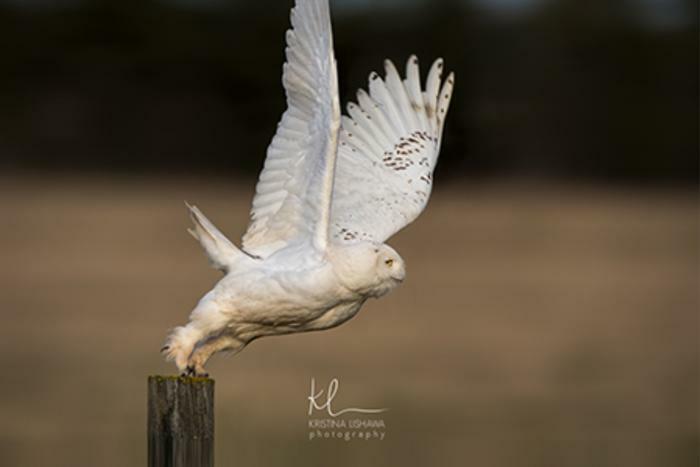 While the migration patterns of the snowy owl are still not well understood, we do know that they can often be found in the Traverse City area from late fall all the way into early spring. If you hope to see them, your best bet is to look along the county roads near open fields. Where there are rodents, you may find owls! They usually avoid heavily forested areas, preferring airport runways and vast, wide spaces that remind them of home. They like to perch high on phone poles, rooftops, and signs and will sit in one place for hours. They tend to blend in with the grey sky, but once you spot your first owl, you’ll usually be able to recognize more! Pay close attention in the hour before sundown when they seem to be most active. When you do find a snowy owl, walk toward it slowly and silently, taking frequent pauses. I have been able to stand within 15 or 20 feet of one approaching it in this way. They are historically unafraid of humans as they have no experience with us in the Arctic tundra, and will often let you approach closely. They are quite easy to photograph for this reason. If you are patient, the owl will look right into your lens! If it takes off, do not chase it and please do not ever feed or “bait” an owl for the purposes of photography. Remember, they are wild raptors, and we need to protect them from associating humans with food. They are also not immune to diseases that rodents from pet stores may carry. If you see an owl that seems to be ill or injured, please contact the MI Department of Natural Resources or call the Wings of Wonder raptor sanctuary. One of this season&apos;s best consolation prizes is encountering one of these white-feathered angels from the Arctic. Their golden gaze, enormous wing spans, and incredibly silent flights are unforgettable! We are truly fortunate to have these visitors from beyond civilization join us in Traverse City. Happy searching, and may you quiver with awe and wonder when you find the mystical snowy owl! 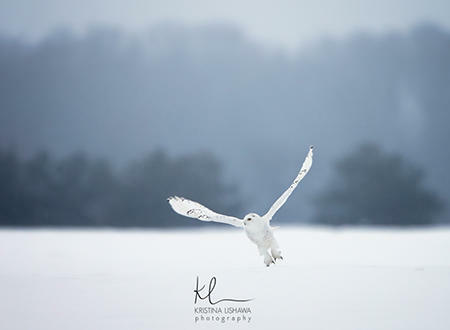 Kristina Lishawa is a nature and wildlife photographer with special interests in birds, landscapes, and night skies of Northern Michigan. Her photography has been featured in the National Geographic Editors’ Spotlight and has won awards in international art competitions. Kristina's photographs have also been featured by the Watershed Center of Grand Traverse Bay, Pure Michigan, MyNorth.com, the Traverse City Record-Eagle, the Botanic Gardens at Historic Barns Park, and the Traverse City Opera House. When she’s not taking pictures, Kristina is a physician who practices internal medicine and pediatrics. She lives in Traverse City with her husband, Brian, and their two sons. More of her work can be seen on her website or on her Facebook page.